In a week that has seen women in Saudi Arabia -- the only country in the world where women cannot drive -- continue their fight to break the taboo, the World Economic Forum (WEF) has published its annual Global Gender Gap Index. 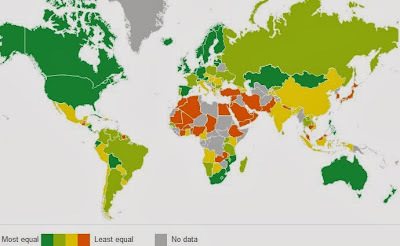 So where is the best country to be a women? Iceland, for the fifth year running, has the world’s smallest gender gap. The 397-page Index was introduced in 2006 as a framework for capturing the magnitude and scope of gender-based disparities and tracking their progress. It benchmarks national gender gaps on economic, political, education and health criteria. It provides country rankings that allow for effective comparisons across regions and income groups and over time. The rankings are designed to build among a global audience greater awareness of the challenges posed by gender gaps and the opportunities created by reducing them. Iceland’s ranking means it is where women enjoy the most equivalent access to education and healthcare and where they are most likely to be able to participate fully in the country's political and economic life. 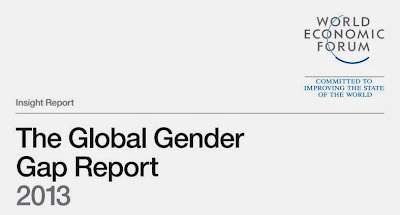 Iceland is joined at the top of the The Global Gender Gap Report, 2013 by its Nordic neighbors Finland, Norway and Sweden. 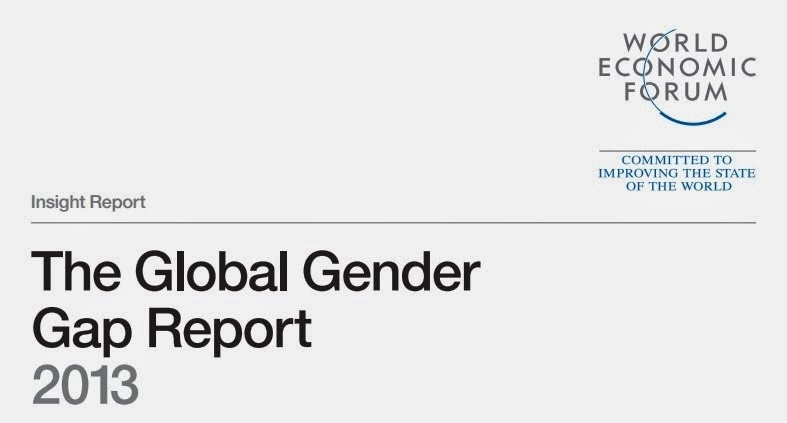 Overall, the gender gap narrowed slightly across the globe in 2013, as 86 of 133 countries showed improvements. However, "change is definitely slow," says Saadia Zahidi, one of the report's authors. In summing up the report, Zahidi tells BBC News Online Europe has seven countries in the top 10. The UK is 18th and the U.S. is 23rd. The Philippines, at fifth, is the highest-ranking Asian nation and Nicaragua is the highest-placed country from the Americas, at 10th. The G20 group of leading industrial nations has no representative in the top 10, nor does the Middle East or Africa. The Middle East and North Africa (MENA) is where some of the greatest gender inequalities exist, the report says. But the picture is far from uniform. For instance, the Gulf states have tended to invest heavily in female education, with a reverse gender gap taking place in the United Arab Emirates. Many more women than men are now finishing university here. This contrasts with countries like Yemen, where levels of female education are very low. MENA closed 59% of its overall gender gap in 2013. Compared to 2006, the region shows a very slight improvement, despite the fact that the Middle East region witnessed a fall in its overall score compared to last year. The region ranks the lowest on the Economic Participation and Opportunity and Political Empowerment sub-indexes with, respectively, only 39% and 7% of the gender gap being closed. Thirteen of the 20 lowest performing countries on the Labor force participation indicator are from the region as are 11 of the lowest on the Estimated earned income indicator. Seven of the lowest countries on the Political Empowerment sub-index are also from MENA. The highest-ranking economies of the region have made vast investments in increasing women’s education levels in the last decades. In Qatar, Bahrain, Kuwait, Algeria, Oman, Israel, Jordan, Lebanon and Saudi Arabia, the tertiary education enrolment rates for women are higher than those of men. However, these countries have had varying degrees of success at integrating women into the economy and in decision-making in order to reap the benefits of this investment. Six out of the 10 high-income countries that rank the lowest on the overall Index are from the region. The UAE (109) continues to hold the top position among the Arab countries and is the only country from the region that has fully closed the educational attainment gap. However, it falls two places in the overall ranking this year because of a decrease on the Wage equality for similar work and in the Estimated earned income indicators. The UAE ranks sixth on the Literacy rate indicator and seventh on the Enrolment in primary education indicator. The UAE is followed by Bahrain (112), Qatar (115), Kuwait (116) and Jordan (119). Qatar maintains the same overall ranking as last year although there has been a small improvement in the overall score. Qatar ranks the highest of the region on the Estimated earned income indicator but the lowest of the region on the Healthy life expectancy indicator. Kuwait falls seven spots this year because of losses in the Labor force participation, Wage equality for similar work and Estimated earned income indicators. Jordan moves up two places. Its improvements are driven by gains in the Educational Attainment and Political Empowerment sub-indexes. 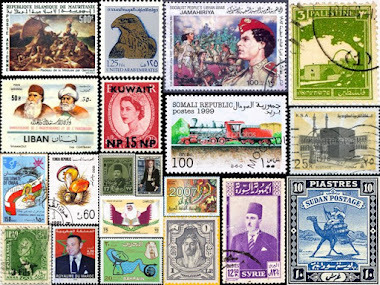 Next are Oman (122), Lebanon (123) and Algeria (124). Oman ascends three places relative to its 125th position in the 2012 ranking thanks to gains on the Economic Participation and Opportunity and Educational Attainment sub-indexes. Oman obtains the best score from the region on the Wage equality for similar work indicator. 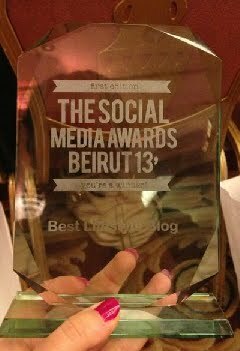 Lebanon moves down one place this year. Lebanon is one of the two regional countries that has fully closed its heath and survival gender gap. Some countries that have made the key investments in women’s education but have generally not removed barriers to women’s participation in the workforce and are thus not seeing returns on their investments in the development of one half of their human capital. This group includes Japan, the UAE and Brazil. They have an untapped but educated talent pool and would have much to gain through women’s greater participation in the workforce. A report by the UN Economic and Social Commission for Asia and the Pacific Countries found that restricting job opportunities for women is costing the region between $42 and $46 billion a year. Research by the World Bank demonstrates that similar restrictions have also imposed massive costs throughout the Middle East, where decades of substantial investment have dramatically reduced the gender gap in education but the gender gap in economic opportunity remains the widest in the world. The third distinguishing feature of the Global Gender Gap Index is that it ranks countries according to their proximity to gender equality rather than to women’s empowerment. Hence, the Index rewards countries that reach the point where outcomes for women equal those for men, but it neither rewards nor penalizes cases in which women are outperforming men in particular indicators. The October 26th Women Driving Campaign that was due to hold a drive-in today in Saudi Arabia to try and end the ban against women driving in the Kingdom, has been dropped after threats of legal actions against anyone getting behind the wheel. However, the ongoing battle Saudi women are waging for their right to drive, though no specific law bans such a right, continues with a call for an open-ended campaign. “Out of caution and respect for the Saudi Interior Ministry’s warnings… we are asking women not to drive and on October 26 and to change the initiative from an October 26 campaign to an open driving campaign, activist Najla Al Hariri told AFP. Women in Saudi Arabia have been attempting to get the driving ban lifted since 1990, when around 40 women drove their cars down a main street in Riyadh. They were stopped by police and a number of them were suspended from work. The women were widely condemned in religious sermons and social circles. 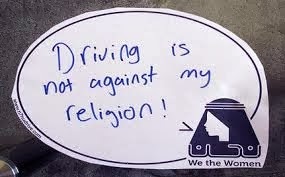 The then Grand Mufti, the kingdom’s highest religious authority, also issued a fatwa against women driving followed by a formal directive by the Minister of Interior banning women from driving. In 2011, women activists re-launched an Internet campaign calling on women with international driver licenses to take to the roads in defiance of the ban. Scores of women got behind the wheel to support the campaign. Some were arrested as a result and were made to sign pledges that they would refrain from driving in future. In September 2011, one female driver was tried and sentenced to 10 lashes. Her sentence was eventually overturned in April 2012. Saudi Arabia is the only country in the world where women are not allowed to drive. Although there is no official law, a ministerial decree in 1990 formalized an existing de facto ban and women who attempt to drive face arrest. Women cannot be issued driving licenses either. But two weeks ago – specifically on October 10 – the October 26th Women Driving Campaign got a spectacular shot in the arm from the kingdom’s most prominent media figure Abdul-Rahman al-Rashed, who is the general manager of Saudi-owned Alarabiya TV news channel. “Whether the government listens to their recommendation or not, the issue of women driving has become a major one involving Saudi public opinion. To avoid upholding women’s right to drive is costly for everyone, both economically and politically. Personally, I cannot imagine being forbidden to drive. I may choose not to drive, as I did during my 20 years living in London. It was a purely financial decision. The cost of petrol, the congestion charge and parking costs alone would have eaten up my salary. Plus, public transport was often quicker. But I still had my driving license with me at all times, just in case. I still remember the feeling -- at 18 -- of getting my driving license and then my first car (a red mini that broke down two days later and had to be returned). Pure bliss! And one of the first things I did on arriving in Dubai seven years ago was own a car. The Saudi Interior Ministry of Interior on Wednesday warned organizers of the October 26th Women Driving Campaign, whose site has been hacked, that group gatherings and marches are illegal. Officials also warned the Kingdom’s strict codes against political dissent on the Internet will be applied to anyone offering online support for a planned protest by women challenging the male-only driving rules. One Saudi woman who is part of the campaign explains the situation in a post on LiveWire, Amnesty International’s human rights blog. The de facto ban on women driving is one of the main things that perpetuates this governmental patriarchy. Currently there is no public transportation system available. You cannot walk to the corner and catch a bus or take the subway except in Mecca. Thus for any woman to get from point A to point B, she doesn’t only have to buy a car but convince a male relative or employ a man from Southeast Asia to drive that car. This day-to-day obstacle has proven to be a demoralizing deterrent for many women from pursuing an education, a career and even maintaining their own healthcare. When government officials are asked about the driving ban, they respond that there is no legal or Islamic basis for it and that it is only socially maintained. The King himself stated so. Others who have made similar statements include the Minister of Justice, the Head of the Commission for the Promotion of Virtue and Prevention of Vice, and the Chief of Traffic Police. Yet when a woman gets behind the wheel of her car, it isn’t society that stops her but the police. In many cases the woman is then taken to the nearest police station and her male guardian is called. The woman and her guardian are both made to sign pledges to ensure that this case of driving while female is not repeated. 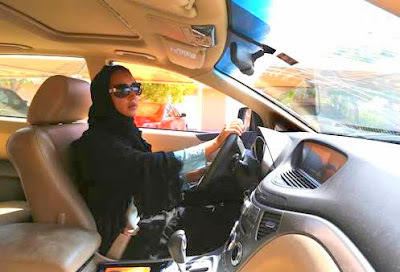 "[Saudi] Officials can no longer use the 'society' excuse"
Amnesty International says it is “astonishing that in the 21st century, Saudi authorities continue to deny women the right to legally drive a car. “The driving ban is inherently discriminatory and demeaning to women and must be overturned immediately. It is completely unacceptable for the authorities to stand in the way of activists planning to campaign against it,” said Philip Luther, Amnesty International’s Director of the Middle East and North Africa Program. I will be thinking of the many Saudi women trying to break the ban, today or on any other day, as I get into my car to go to work. Good luck ladies. You will win! 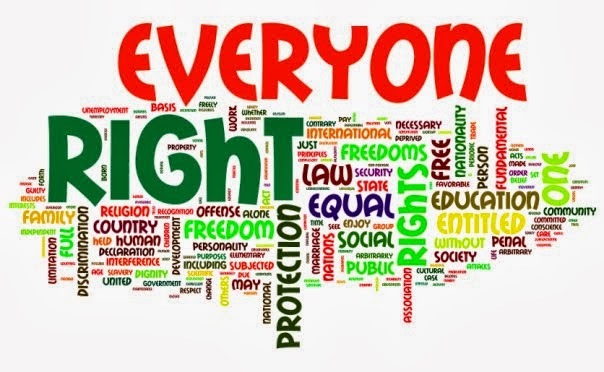 It is 65 years since the declaration was adopted by the UN General Assembly as the first global expression of rights to which all human beings are essentially entitled. It is thus sad to see freedom, equality, dignity and other basic rights still lacking in so many of our region’s countries. 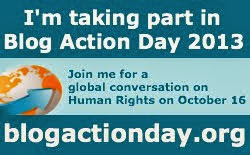 Human Rights is this year’s theme of Blog Action Day when thousands of bloggers -- bloggers, podcasters, photographers, graphic designers, cartoonists, data geeks, tumblers and social media types -- from all over the world come together to talk about one important issue. Previously, Blog Action Day focused on such issues as the Environment (2007), Poverty (2008), Climate Change (2009), Water (2010), Food (2011) and the Power of We (2012). It is perhaps coincidental, but there has rarely been a time when human rights are so needed, whether in the Levant or globally. It is as if humans have lost their humanity to react to the events unfolding around them. The upheavals in the MENA (Middle East and North Africa) region since January 2010 – including Tunisia, Libya, Egypt, Yemen and chiefly Syria -- have put paid to human rights. And in Palestine, they have been flouted throughout the past 65 years. 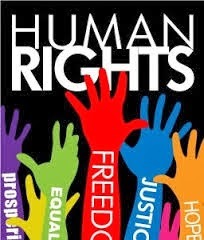 “Human rights are inalienable. They should not be taken away, except in specific situations and according to due process. For example, the right to liberty may be restricted if a person is found guilty of a crime by a court of law. Reading through the 30 articles of the Universal Declaration, I didn’t find a single one being upheld in either Palestine or Syria among others. Can you? Isn’t it time we put back the Rights in Human? More than 1.5 billion Muslims worldwide will today celebrate Eid al-Adha at the end of Hajj. It is a time of celebration, but also one to think of those less fortunate. My prayers and thoughts go to a dear friend who is battling sickness. They are also with those not celebrating due to illness, war and poverty. I wrote extensively about Eid al-Adha in a post two years ago, but here again is what Hajj and Eid al-Adha is all about for those new to Mich Café and to the customs of the region. 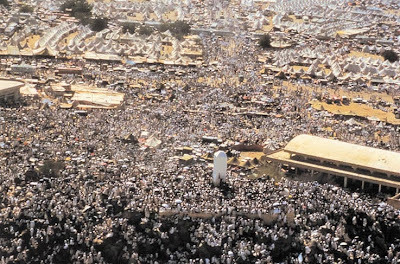 Literally, Hajj means “to set out for a place." For Muslims, that place is the Holy City of Mecca, in Saudi Arabia. Muslims worldwide celebrate Eid al-Adha to commemorate the willingness of Abraham (Ibrahim) to sacrifice his son Ishmael as an act of obedience to God, before God intervened to provide him with a ram to sacrifice instead. Hence the sacrifice of a lamb, a goat, a cow or a camel on Eid al-Adha. The sacrificial meat is divided into three parts: one-third for the family; another third for relatives, friends and neighbors; and the remaining third to the poor and needy. Eid al-Adha is celebrated annually on the 10th day of the 12th and last Muslim month of Dhu al-Hijjah of the lunar Islamic calendar. Celebrations start after the Hajj, when Muslims descend from Mount Arafat. One of the main trials of Abraham's life, at 99, was to fulfill God’s command to devote his dearest possession, his then only son Ishmael, 13. Upon hearing this command, he prepared to submit to God's will. During this preparation, Satan tried to dissuade Abraham and his family from carrying out God's commandment, but they drove Satan away by throwing pebbles at him. 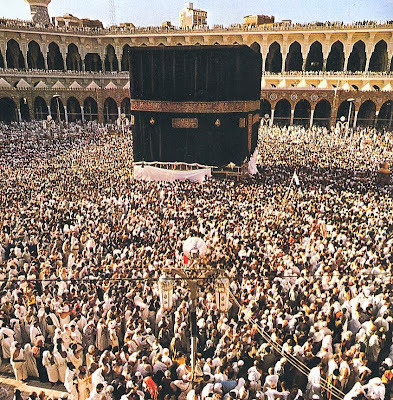 In commemoration of their rejection of Satan, stones are thrown at symbolic pillars signifying Satan during the Hajj rites. Ishmael married the daughter of the chief of the Banu Jurhum, a tribe that had settled in the Mecca valley. 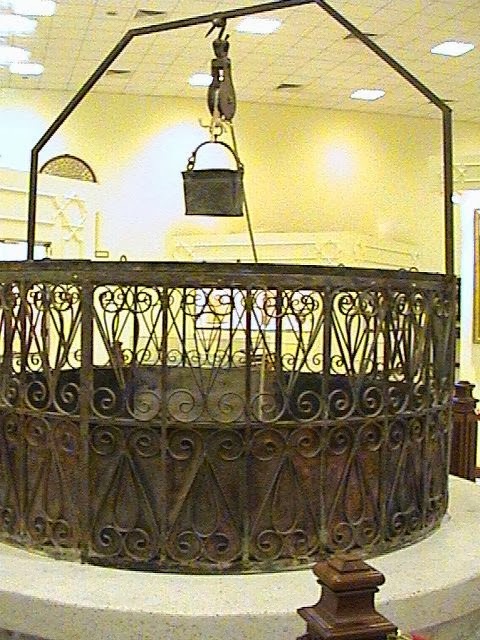 When Ibrahim died, Ishmael continued to perform Hajj each year and to look after the Kaaba. After Ishmael, the Kaaba came into the possession of the Banu Jurhum tribe for many centuries until the Khuza'ah tribe took it over. 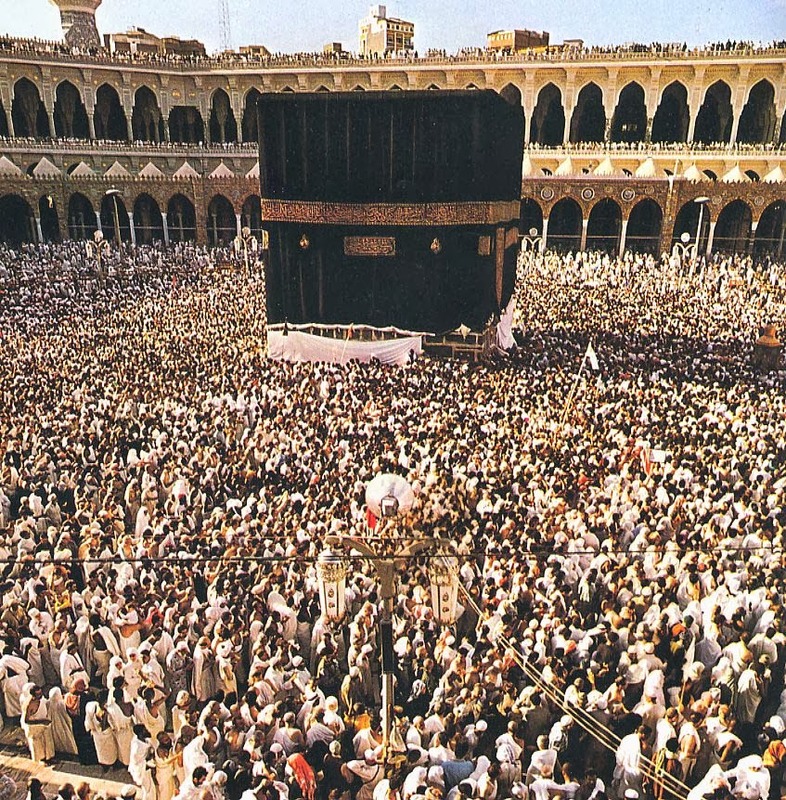 Throughout this period, the Kaaba was vulnerable to flooding and was virtually destroyed. 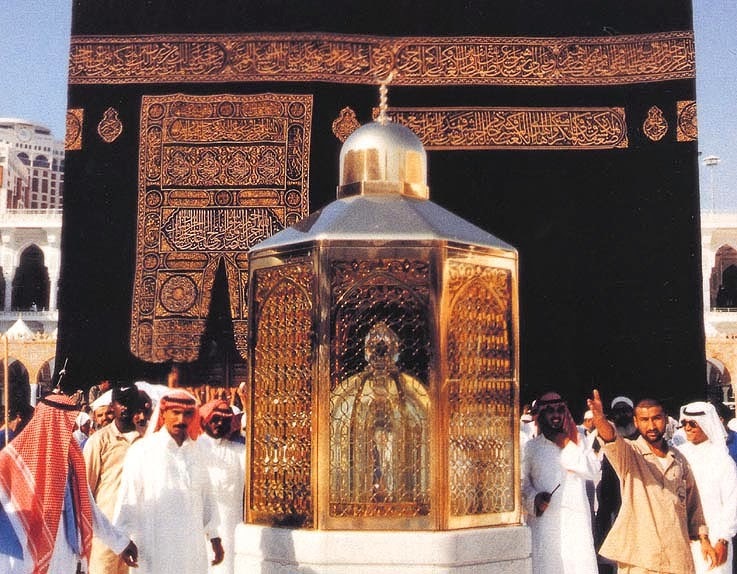 Seeing the Kaaba in a state of disrepair, Qusay bin Kilaab, of the Quraysh tribe, rebuilt it, according to the original design but adding a roof to protect it from the extremes of weather. Qusay, born around 400 CE, was renowned for his wisdom. 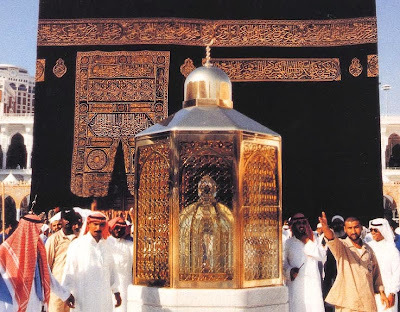 The Kaaba, is a large stone structure constituting a single room with a marble floor. 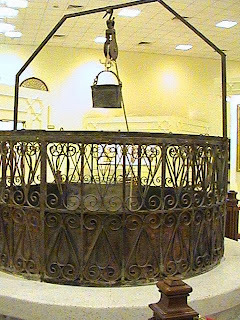 It lies at the heart of the Holy Mosque (al-Masjid al-Haram). It stands some 60 feet high and each side is approximately 60 feet in length. The four walls of the Kaaba are covered with a black drape that is 45x135 feet -- the Kiswah. Every year, a new Kiswah is prepared, embroidered in gold thread with the Shahadah and verses from Qur'an and carried to Mecca by pilgrims. A recent estimate of producing the Kiswah each year put the cost at about $4.5 million. During the Hajj, the black Kiswah is replaced by a white cloth, matching the white robes of the pilgrims. At the end of Hajj, the newly woven Kiswah is placed over the Kaaba. The old one is cut into small pieces and given to pilgrims from different Muslim countries. I wish all my readers celebrating the occasion a happy, healthy and blessed Eid al-Adha. 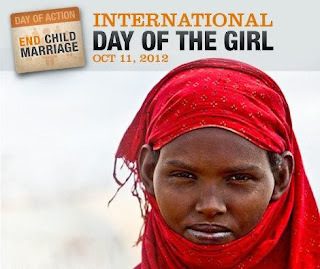 Today, October 11, marks the second International Day of the Girl Child. The United Nations declared October 11, 2012, the first Day of the Girl to focus attention on girls' empowerment and the fulfillment of their human rights. This year's observation targets their education. Some decades ago, aged eight or nine, I was given the choice of either doing well at school or being a housemaid. My mom took me out of school for three days to show me how it would compare. I was back at school after the second. Although my dreams and ambitions of higher education were quashed by the Lebanon civil war, I have since been a strong supporter of education in general, but especially girls’ education. Having worked since age 12, I am also a firm believer in the woman’s role in the workplace and global economy. Girls face discrimination and violence every day across the world. The International Day of the Girl Child – designated on December 19, 2011 in UN General Assembly Resolution 66/170 -- focuses attention on the need to address the challenges girls face and to promote girls’ empowerment and the fulfillment of their human rights. The fulfillment of girls’ right to education is first and foremost an obligation and moral imperative. There is also overwhelming evidence that girls’ education, especially at the secondary level, is a powerful transformative force for societies and girls themselves. It is the one consistent positive determinant of practically every desired development outcome, from reductions in mortality and fertility, to poverty reduction and equitable growth, to social norm change and democratization. While there has been significant progress in improving girls’ access to education over the last two decades, many girls -- particularly the most marginalized -- continue to be deprived of this basic right, according to the United Nations. Girls in many countries are still unable to attend school and complete their education due to safety-related, financial, institutional and cultural barriers. Even when girls are in school, perceived low returns from the poor quality of education, low aspirations, or household chores and other responsibilities keep them from attending school or from achieving adequate learning outcomes. The transformative potential for girls and societies promised through girls’ education is yet to be realized. Recognizing the need for fresh and creative perspectives to propel girls’ education, the 2013 International Day of the Girl Child will address the importance of new technology as well as innovation in partnerships, policies, resource utilization, community mobilization, and most of all, the engagement of young people themselves. To mark International Day of the Girl Child today, a UK charity calls on nations to urgently prioritize quality education for girls as an essential factor in tackling crippling poverty. Plan UK, a global children’s charity founded 75 years ago, has a petition running to call on the United Nations to make girls’ education a priority in its new development agenda. The “Raise Your Hand” petition has reached over one million hands raised and is now aiming for four million. Plan works with the world’s poorest children so they can move themselves from a life of poverty to a future with opportunity. Globally, it is estimated 65 million girls are out of school, with one in five adolescent girls around denied an education by the daily realities of poverty, discrimination and violence. Disasters and emergencies can make these problems worse. Supporting girls’ education is one of the single best investments a government can make to help end poverty and give hope to girls, otherwise denied their rights and aspirations, Plan says. Plan UK is celebrating the worldwide support shown for the petition on the first anniversary of the shooting of Malala Yousafzai who has become a global spokesperson on the subject since she was shot by the Taliban in October 2012 for going to school. Malala is just one of the many people around the globe to have raised her hand for our Because I Am A Girl campaign. The petition has now reached 1.5 million signatures and will be presented to the UN Secretary-General Ban Ki-moon. Plan’s Because I am a Girl campaign aims to support four million girls to stay in education and fulfill their potential. Plan’s campaign will be in London’s Trafalgar Square today from 10.30 a.m to unveil a giant “erasable” billboard to remind the world that every girl has a right to go to school. 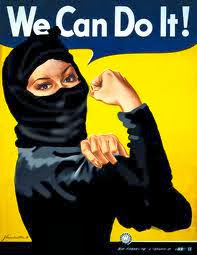 Plan will also be “pinkifying” monuments around the world for the second year running on International Day of the Girl. Monuments including the Empire State Building will be glowing pink in support of girls’ education. less likely to marry and to have children whilst she is still a child. more likely to be literate, healthy and survive into adulthood, as are her children. more likely to reinvest her income back into her family, community and country. Last year’s Day focused on child marriage, which is a fundamental human rights violation and impacts all aspects of a girl’s life. Child marriage denies a girl of her childhood, disrupts her education, limits her opportunities, increases her risk to be a victim of violence and abuse and jeopardizes her health.